We have a winner in my 100 Follower Giveaway!! #13, Christy from Christy Blade Handmade!!! Please e-mail me with your mailing address so I can get your goodies sent out to you! Here is a short video showing how I picked the winner, in case you are interested. Sorry about the quality of it, I used my webcam and it usually does a decent job, but I guess because I was filming the computer screen it didn't work so great. 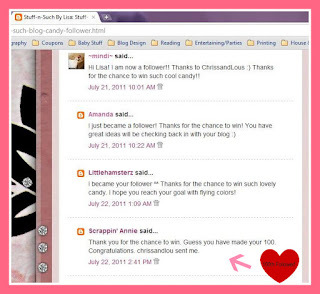 Thanks again to all who entered and who have come to visit my blog! Goal Reached - 100 Followers!! I've reached my very first blog goal of 100 followers! My 100th follower is Scrappin' Annie! 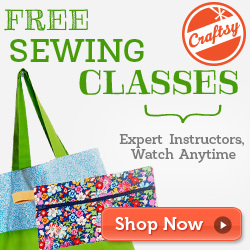 She is a new crafty blogger, so if you get a chance, check out her blog and follower her also! 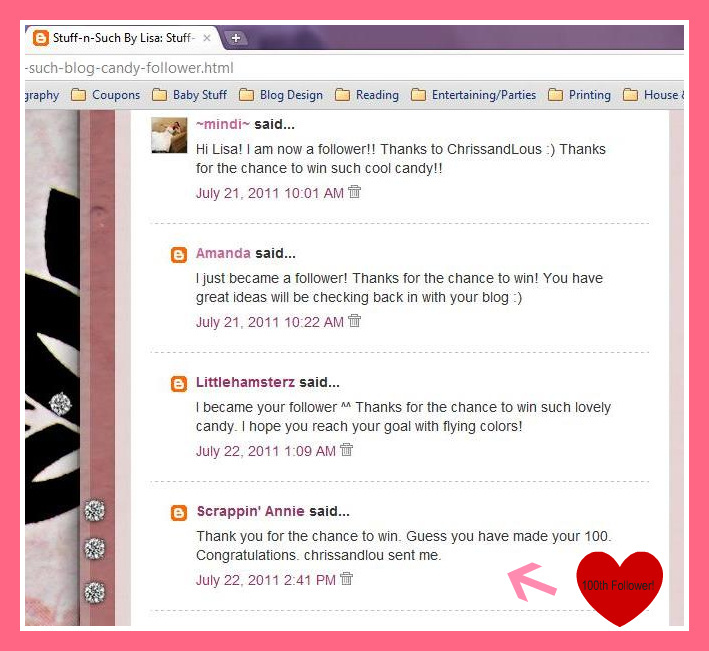 Thank-you for visiting my blog Annie and following along! Now, as I had stated in my blog candy post, I am leaving this giveaway open until 12:00 Midnight (PST) today/tonight (22nd). I will pick a winner after that time using random.org. Thanks so much to all of you for coming here and becoming a follower! It is just so awesome to have friends who share in my crafty endeavors! I hope to be better about posting more often. I recently decided to go back to school to learn graphic arts and that has kept me very busy, along with being a stay-at-home Grandmother and Wife! Take Care my crafty friends and please come back soon!! I never even knew that Ikea had cards! I was pleasantly surprised to find these little nuggets in my gift bag, as they are different and a bit unusual, which inspires some creativity in me. I really liked the stitching on the envelopes, it adds an elegant touch without being distratcting. I tried to find out some more info on these cards online, but couldn't find anything. I was curious to know what they are made of, because they feel almost like they are part paper and part fabric! I couldn't wait to try them out and see how the fibrous material reacted to different mediums. The catepillar card was made using a digi design from my dear bloggie friend Nikki at Melonheadz Illustrating. She is SO very talented, if you get a chance, check out her blog and see some of the awesome digital images she offers. Incredibly, she does not charge for most of them, but she does accept donations on her blog site and I hope you will donate if you like and use her images. I started out by experimenting with some stamp pads and a natural sponge on the background of this card. I wanted to bring out the natural texture of the card material and see how it would look. I was pretty pleased with how it turned out, it looks almost like it is lightly tie-dyed! I sized down the digi from Melonheadz to fit my card and then printed it out on white cardstock and cut it out. I colored it using copics sketch markers and then gave it dimension by coating it with glossy accents and adding pop dots to the back to adhere it to the card. The word "Thanks" was cut from one of my cricut cartridges, but I'm not sure which one, as it was from my "extra" stash of cuts. I embossed the word "thanks" to give it a bit of pop. I added a strip of ribbon and small purple flower brads to finish the card with a bit of charm. The bow on this card was made using a technique I found on a fellow-blogger's site Seongsook's Creations. I am terrible at tying bows...especially tiny ones and this tip was a big help! Cricut Cartridge: Flower Shape & "Thank-you"
Of course I stamped the back of both of my cards with my custom stamp by PSA Essentials. Thank-you for checking out my blog! Hope you'll return soon...don't forget my follower giveaway posted on my sidebar and here. I am almost at my goal of 100 followers!! Yay!